For many, Prometheus was a love-it-or-hate-it experience. For me, it was a disappointment because it felt like a movie of promising but unfulfilling half-measures: raising interesting questions but failing to deliver any logical answers, bringing in new characters heavily templated on old ones - Elizabeth Shaw as a sort of New Ripley and David as our New Ash. It had a lot of interesting ideas and some good moments, but was overstuffed and confusing, ultimately failing in execution. So it wasn't a big surprise to see that Alien: Covenant shied away from the Prometheus angle in marketing and focused once again the human v. xenomorph factor instead. In fact, even though Michael Fassbender returned for the follow-up, I wasn't expecting there to be any connective tissue between Prometheus and this film at all. It turns out there is - sort of. But it's mostly misguided and unsatisfying, awkwardly fusing itself with a tepid remake of the original Alien film. Alien: Covenant takes place shortly after Prometheus and focuses on a group of humans heading to a new colony in cryosleep. Something goes wrong and essential crew wake up mid-journey, where they happen to stumble upon a distress signal from a nearby planet with hospitable conditions. The crew consists of some archetypes, including your standard Alien issue "tough female protagonist," but unfortunately, if you're like me, you'll walk out of the movie without remembering anyone's name. Said group of humans decide to answer the distress signal and end up spending the rest of the movie running, screaming, and having creatures burst out of their bodies. It's arguable that Ripley is one of science fiction's best-known characters, and she anchored the Alien films by providing true stake in the outcome of the humans. Noomi Rapace's portrayal of Elizabeth Shaw in Prometheus obviously fell short of her inspirational Ripley archetype, but I liked her - and at least recognized her as a clear protagonist. The most serious flaw of Alien: Covenant is that it provides us with yet another Ripley-like-stand-in via Katherine Waterston's character, which at this point resembles an illegible copy of a copy of a copy. Waterston isn't at fault, but her character development is almost non-existent, relying wholly on the hope that you'll associate her enough with Ripley to forgive the fact that she was written primarily as a foil for David. In the original Alien films there was also a thematic emphasis on the roles of mothers, both via Ripley and the aliens, while the latest films have shifted focus to of the father. This was badly pronounced by Charlize Theron's character in Prometheus, and we see more of it in Alien: Covenant, particularly with Michael Fassbender's David. And while Fassbender's performance and role in this film is basically the only part of it I enjoyed, that new paternal thematic weight doesn't really work when the film's protagonist has no connection to it. In fact, there was almost no room for any of the human characters in Alien: Covenant. The real plot of this movie was entirely about androids and creation, a sort of Frankenstein take on the franchise. Removing the human element from the plot made the horror much less visceral. So instead of producing scares, Alien: Covenant felt more like a gory summer camp slasher film, full of paper-thin characters making dumb decisions that will get them killed, interspersed with moments of theology lessons that dampen what little scares the CGI aliens manage to conjure. 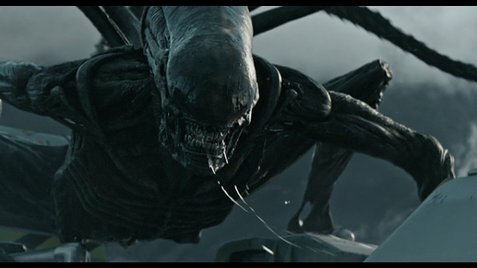 I think the filmmakers rightfully seized on one of the MVPs from Prometheus in Michael Fassbender, but unfortunately building a whole film around him was ultimately damaging to the overall story of Alien: Covenant. I hope if Fassbender continues to be the face of the franchise going forward, they find a fresh way to tell the story, rather than relying on the classic Alien formula without the key ingredient: Ripley.